The Electro-Gun itself is totally NON-CHEMICAL, therefore it is not necessary to move out of your home for several days or to remove food, plants, plastics, clothing, furniture. Everything can remain in place while the Electro-Gun is taking place. There is no residual danger to pets, kids or other humans. There are no worries about possible damage to the roof, satellite dish, solar panels or exterior plants as can happen with a structural fumigation treatment. Because of the mobility of the Electro-Gun, it can be used to treat diagnosed infestations in just about any accessible area of the home or building. What is the Electro-Gun Treatment System? The Electro-Gun is an innovative, technically intricate, hand-held electronic system that combines high frequency and high voltage to overcome wood's natural resistance to electrical current flow. It is proudly made in the USA and holds multiple US patents. The system allows electrical current to penetrate wood and flow into the galleries and nests of drywood termites, killing them by electrical shock. The Electro-Gun System is NOT to be confused with any of those electronic "plug-in" devices you may have seen on TV or in magazine ads that supposedly rid your house of all insect pests. The Electro-Gun is a unique, powerful, effective, one-of-a-kind, viable product that more and more pest management companies are adding to their arsenal of tools in order to offer IPM (integrated pest management) and GREEN methodology to treat insect infestations. On the treatment date, an Electro-Gun technician certified by Etex Ltd. will arrive at your home. He should have a copy of a "Customer's Preparation Guide" that was filled out and signed by you and the inspector. Using this guide, he should walk through the house to make sure that all items listed have been properly moved or prepared. If everything is in order, he will bring in the equipment to start the treatment. Before starting the treatment, the technician should ask you to leave the area he is about to treat, to avoid any distractions or accidents. The technician should then thoroughly treat the areas of known infestations located by the inspector during his inspection. The areas around the known infestations should be scanned for any signs that the infestation may extend farther than is visibly evident. During the scanning process, the technician passes the Electro-Gun's high voltage probe over the surface of the infested area, using a slow, sweeping motion, scanning for signs of infestations. Upon contacting a termite gallery, the arc, which is usually scattering over the surface, will be drawn into the gallery. 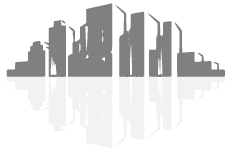 The pitch of the Electro-Gun's hum changes as the electricity contacts the nest, and travels through the tunnels, galleries and exit and entrance holes, killing the insects in the wood. At that point, the technician, guided by the change in pitch and the arc's appearance, should thoroughly treat the entire area. 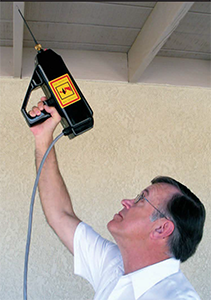 For over 3 decades and standing the test of time, the Electro-Gun has been used to successfully treat and kill drywood termites in thousands of homes as well as nursing homes, hospitals, hotels, condominiums, apartments, and even historical landmarks. When it comes to your families' most important investment have San Joaquin Pest Control check your home and prescribe the best treatment.With over 40-plus years of industry experience, we understand their behaviors and biology. Our team of inspectors has the experience to locate the problem and diagnose the best termite treatment to rid your structure of the infestation. Q. What is the difference between a swarming termite and a flying ant? A. Swarming termites are winged reproductive termites. Black to brown in color with four wings of equal size, a broad waist and straight antennae. They fly from their colonies to mate and start new infestations, most commonly during the spring and fall seasons. Flying ants are winged reproducers similar to a termite - a swarmer identified by two sets of different sized wings, a pinched waist and elbow-shaped antennae.